“We want to give our students as much of an opportunity as possible to have breakfast in the morning – that’s our motto,” said Kayla Foster, who is now a Dietetic Intern but at the time of this interview was Aramark’s Food Service Manager for Elmwood Park Community Unit School District (CUSD) 401. Before school starts students can grab breakfast off the cart stationed in the main foyer or get breakfast in the cafeteria. A few minutes prior to the end of first period the cart travels down to the heart of the first floor hallway where students can grab breakfast on their way to their next class during the five minute passing period. After second period, students have another opportunity to grab breakfast from the cart. “Students who come in expecting to have breakfast in the morning can have it while Second Chance helps students know they have another opportunity to have breakfast if they need to focus on other things in the morning such as completing their homework,” said Foster. 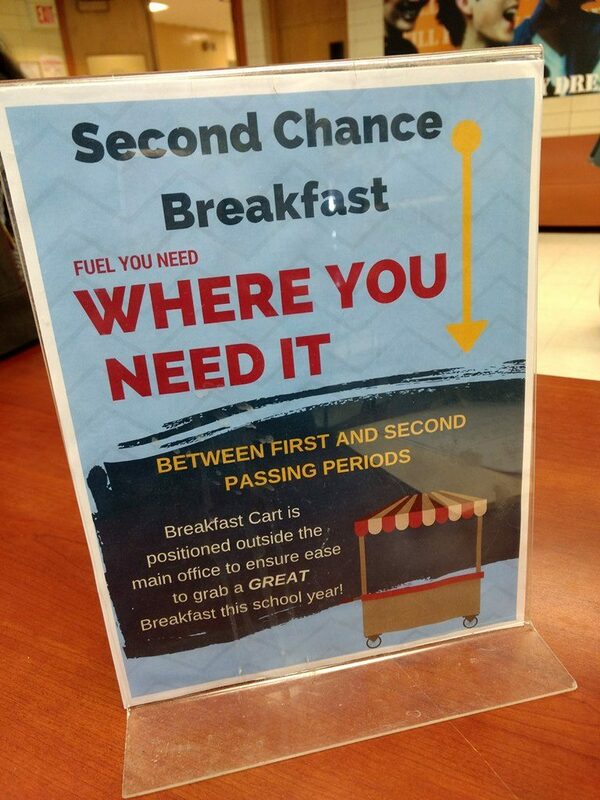 Since implementing Second Chance, the high school and middle school has seen an increase in breakfast consumption. Students eating breakfast in the high school has doubled; in the middle school it went from only a handful of students eating breakfast to over 100 students partaking in breakfast daily. Elmwood Park High School Breakfast Staff in the middle of the main hallway right before the end of first period. “Kids don’t sit and eat as much as they used to so we had to adjust the meal program to satisfy that. 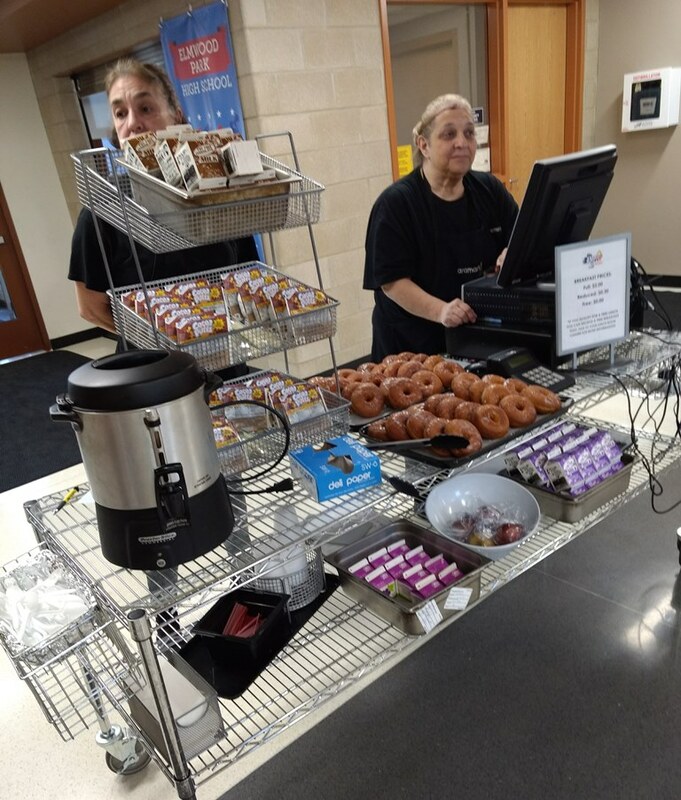 When we started moving food out of the traditional lines and putting it out into the common areas and hallways we saw an uptick in our breakfast numbers,” said Doug Wildes, Elmwood Park High School Principal. Accessibility, location, and knowing what the students want keep them coming back each morning for breakfast. Elmwood Park staff stays attuned to student preferences by gathering their feedback and updating menus accordingly on a weekly basis. “Getting student feedback from those that have interactions with them daily and the student view point survey gives us ideas of what the students want, what they like, and if there is anything we can change while staying within the USDA guidelines,” said Michelle Hyman, Aramark Food Service Director for the Elmwood Park School District. Principal Wildes observed a trend with his high school students drinking coffee so the high school started offering coffee from the cart along with breakfast. “We are trying to meet the students not only where they are physically but in terms of their demand for breakfast options,” said Wildes.